The first unique stop today was at the side of the road, where we found a dozen trees completely filled with the biggest fruit bats we have ever seen, with a wingspan of 120 cm (48 inches!). In fact, we were told these were some of the biggest bats in the world. These bats are also known as flying foxes. Though they fly, they are not considered to be birds. Most were sleeping (center), as bats are prone to do during the day. Every so often though, one would fly from one tree to another, as we tried to catch photographs of them in flight. There were several egrets that joined the party, as captured in the bottom image, when it decided to leave the tree. 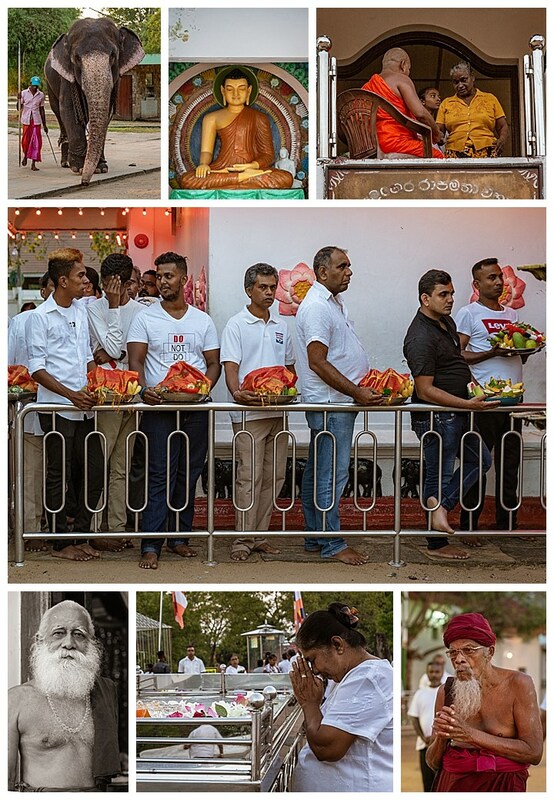 Later, we walked to the Temple of Kataragama, which is an important religious site for Buddhists, Hindus and Muslims. Enroute to the ceremony, we saw an elephant in a river getting a bath (left-center). 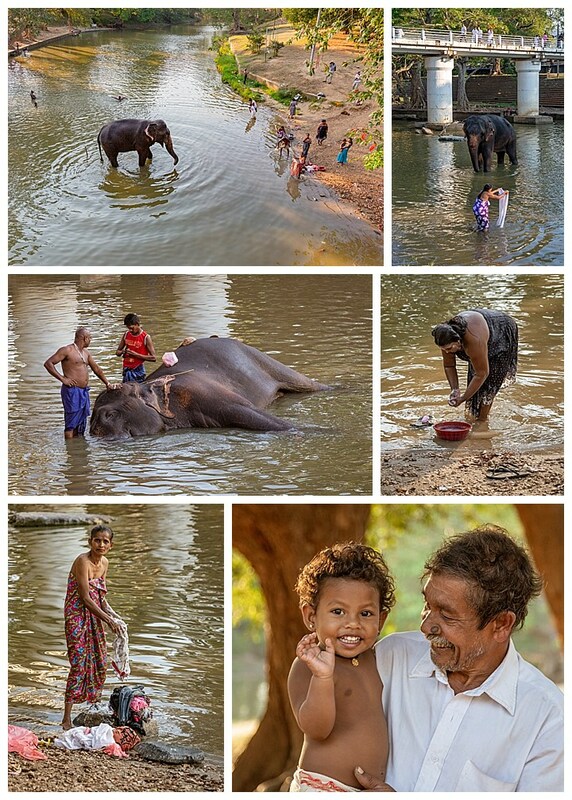 Many in the village were also in the river, bathing themselves, washing clothes, or simply cooling off. Sri Lanka is always hot and humid year-round, varying by only a few degrees in all seasons, so the river is a pleasant place to escape the weather. As we proceeded further towards the temple, an unusual parade came down the street behind us. It was composed of only seven people. Two were carrying semi-circular arches over their heads (bottom-left). 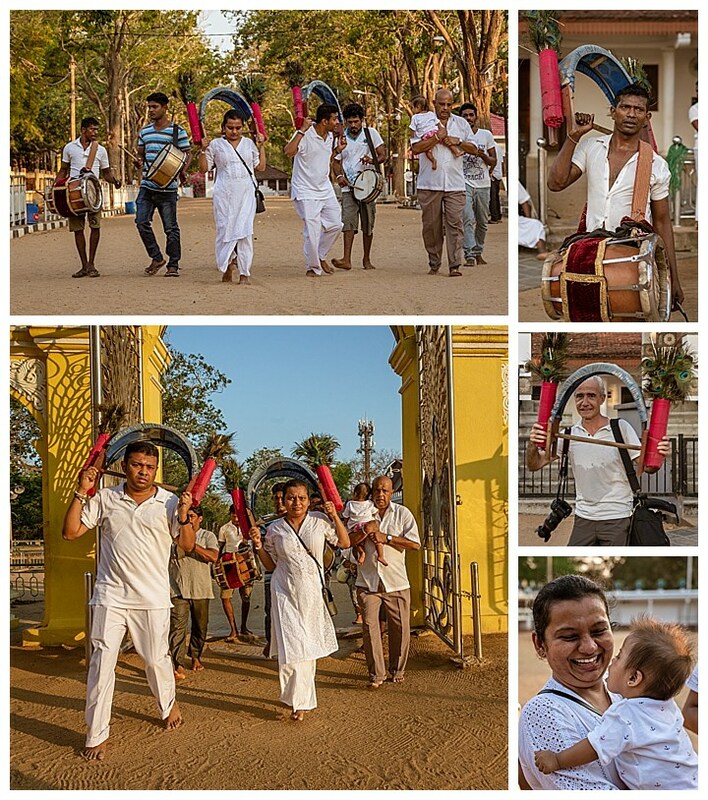 One was carrying a baby, and the others were beating on drums. After the parade, Mehmet (our guide) tried to ask one of dancers to pose (middle-right), but was not able to get his request understood. A bit later, we talked to the mother (center person in image bottom-left, and bottom-right holding the baby) and asked about the purpose of the parade and prayer. We were told that the baby had open heart surgery at the age of 6 months. That was 6 months ago, and the parade and prayer were to thank their gods that the baby was alive, and to ask for his continued health. 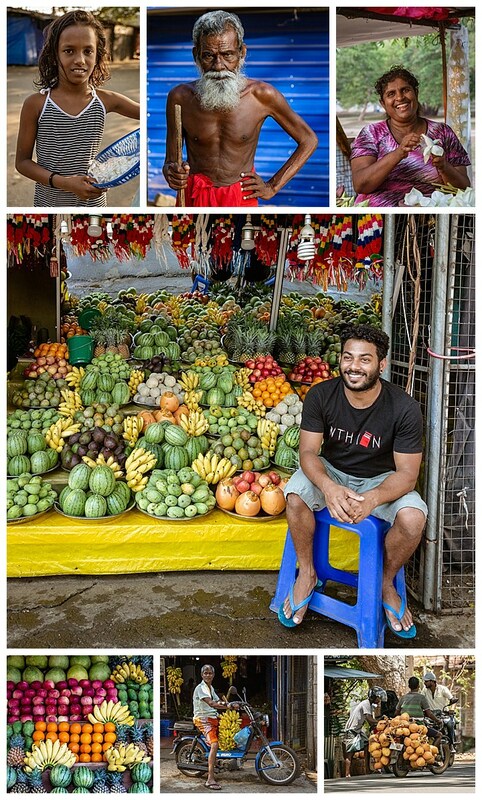 Along the way to the temple, the streets were lined with vendors selling fruits in colorful displays, and often pre-packaged on plates. Other vendors sold lotus flowers. These were all intended to be purchased, and then offered to the gods at the temple. When we finally reached the temple, we saw a line of men holding plates of food, most likely purchased from the vendors above, to be given to the priest as an offering to their gods. The elephant that had been washed in the river earlier also made an appearance (upper-left). A monk was blessing people on the second floor (upper right).